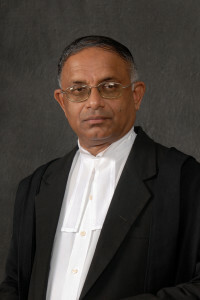 Dr Jayampathy Wickramaratne is President's Counsel and Member of Parliament. He counts 41 years as a practising lawyer in Sri Lanka. In 2001, he was appointed President’s Counsel, equivalent to a Queen’s Counsel in England. The main areas of his legal practice are constitutional law, human rights, administrative law and criminal law. He holds a Master’s degree in Public Administration from the Post-graduate Institute of Management, University of Sri Jayewardenepura and was awarded the Ph. D. degree by the University of Peradeniya for his thesis titled “Fundamental Rights in Sri Lanka”. The thesis has been published with a second edition. Dr. Wickramaratne served as Consultant in the Ministry of Justice and Constitutional Affairs from 1996 to 2001. He was Senior Advisor in the Ministry of Constitutional Affairs in 2004 and from December 2005 to February 2008. He was a member of the Government’s Constitution Drafting Team that drafted the Constitution Bill of 2000. He chaired a committee appointed by the Inter-Ministerial Committee on Human Rights to draft a new constitutional Bill of Rights. From January to July 2015, he was Senior Advisor to the President of Sri Lanka on Constitutional Affairs and played a key role in the drafting of the Nineteenth Amendment to the Constitution. Dr. Wickramaratne is a member of the Parliament of Sri Lanka since August 2015. He is a member of the Steering Committee of the Constitutional Assembly which is tasked with preparing a new draft Constitution. He is also a member of the Parliament’s Committee on Standing Orders. Dr. Wickramaratne has extensive experience in the legal sector of Laos, having worked there for the United Nations Development Programme (UNDP), United Nations Office on Drugs and Crime (UNODC), the European Union and Swedish Sida over the past 16 years. His work includes being Chief Technical Advisor in the UNDP’s Legal Sector Preparatory Assistance Project in the Ministry of Justice, Team Leader of the UNDP’s Legal Sector Evaluation, consultant to International Law Project, Consultant to the Regional Workshop on Treaties for countries of South-East Asia, Legal Advisor to the UNODC’s human trafficking project for three years and human rights expert for activities funded by the European Union from 2015 to date. Dr. Wickramaratne has written extensively on legal and constitutional issues and presented numerous papers at international and local events. His latest publication is “Towards Democratic Governance in Sri Lanka: A Constitutional Miscellany” - a collection of papers on constitutional law, power-sharing, human rights and international law.